I started reading the Sookie Stackhouse books right around the time the show True Blood was announced, and always preferred the books over the show. Well until the end, then they got...bad. My personal opinion of course, but they are still one of my favorite book series. Well this month's Notoriously Morbid Vanishing Cabinet subscription is based on the Sookie Stackhouse books! If you've only seen the show, you won't recognize the character one of the shadows is based off of, but I think the colors this month are just beautiful, probably my favorite Vanishing Cabinet so far! The Notoriously Morbid Vanishing Cabinet is shipped via USPS during the middle of each month, and this month's arrived in 2 days from West Virginia to California. 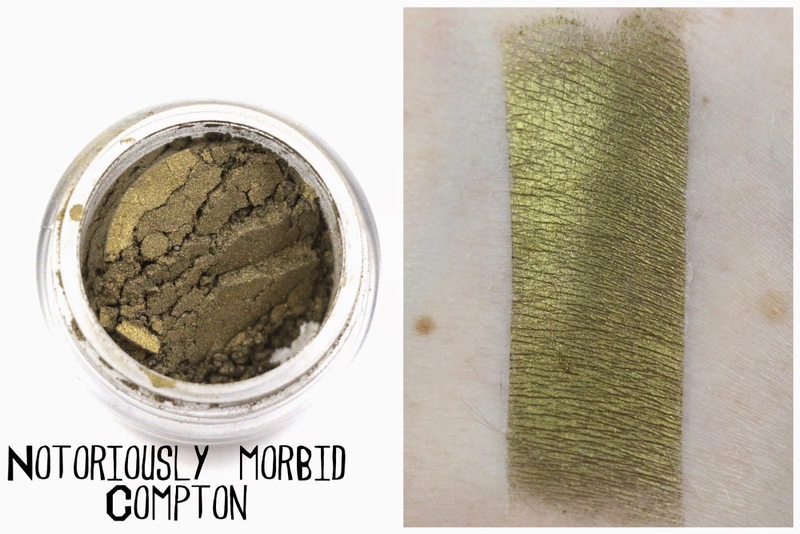 Mmmmm olive green...I love olive green shadows, and this one has a strong golden sheen. 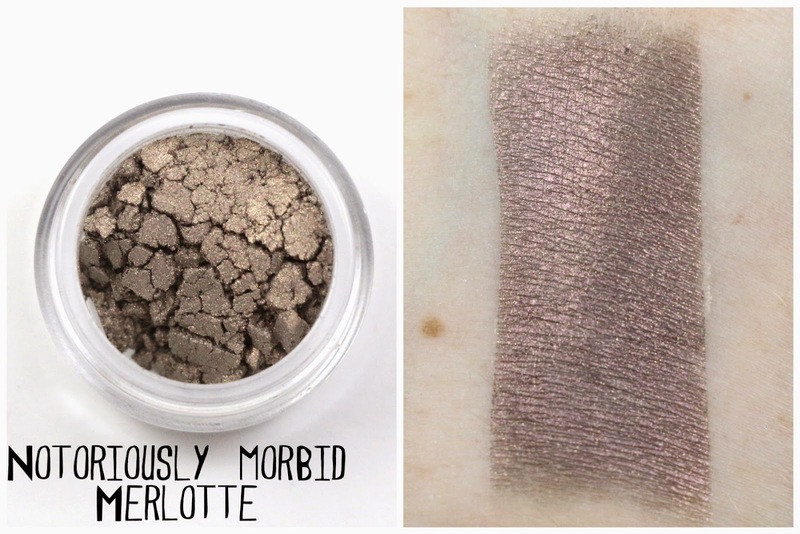 It's a very metallic shade, so it goes on really smooth and buttery. This might be my favorite shade of the collection this month. 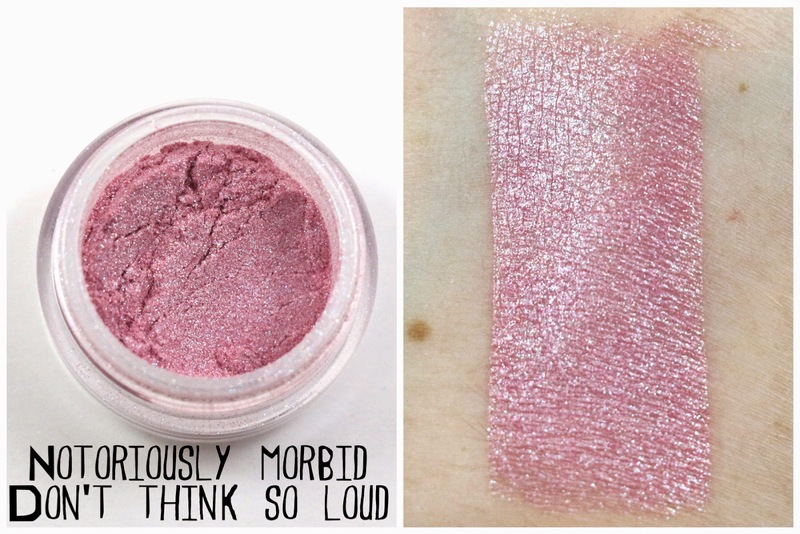 This shade is a baby doll pink with a strong silver/blue sheen and green sparkles. 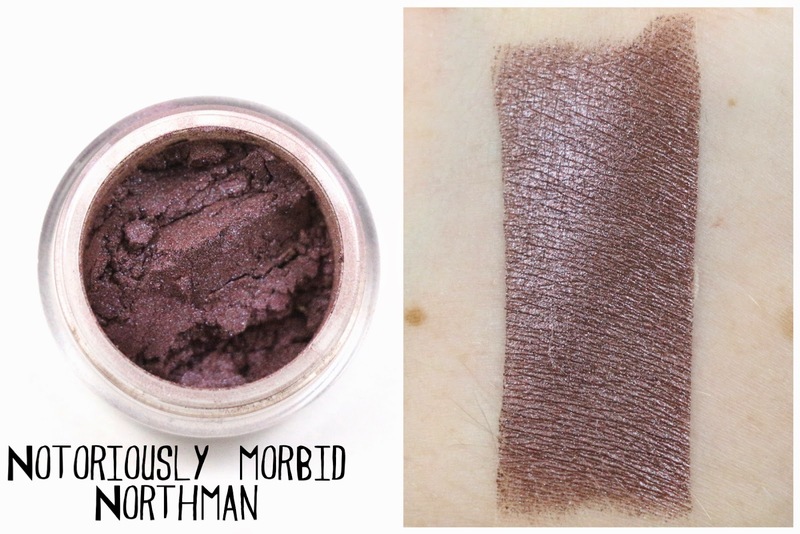 Comparing this to my last month's sneak peek shade, it looks like this one was slightly reformulated, just like last month. It's a very sparkly pink, just like Sookie. This is a difficult shade to describe, but it's kind of like a taupe-y brown with red sheen and golden sparkles. It's a very pretty neutral without being plain and it looks different in many different lights. A perfect shade for Sam. 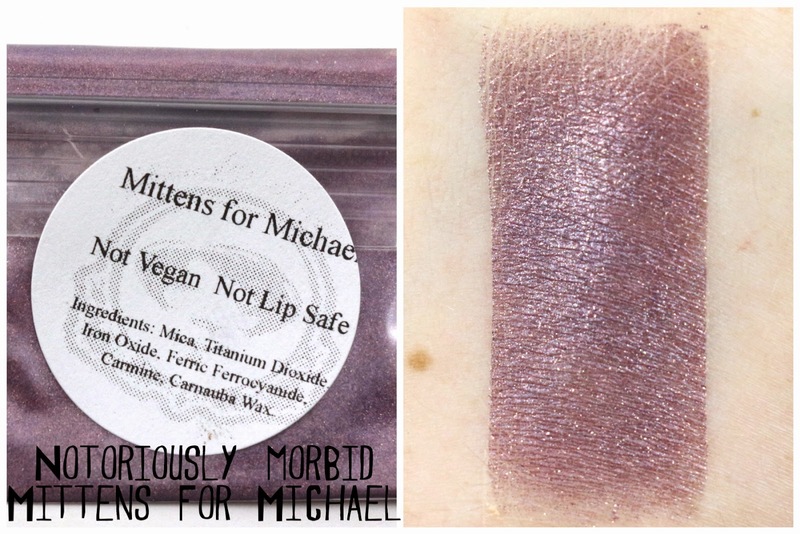 I'm wearing this shade today and it's a very dark berry purple with a blue duochrome and blue sparkles. It blends out really nicely, and I think it would look great with Don't Think So Loud. Quinn is a character that was never in the show True Blood, he only appeared in the books. This is a bluish gray shadow with possibly green sparkles. 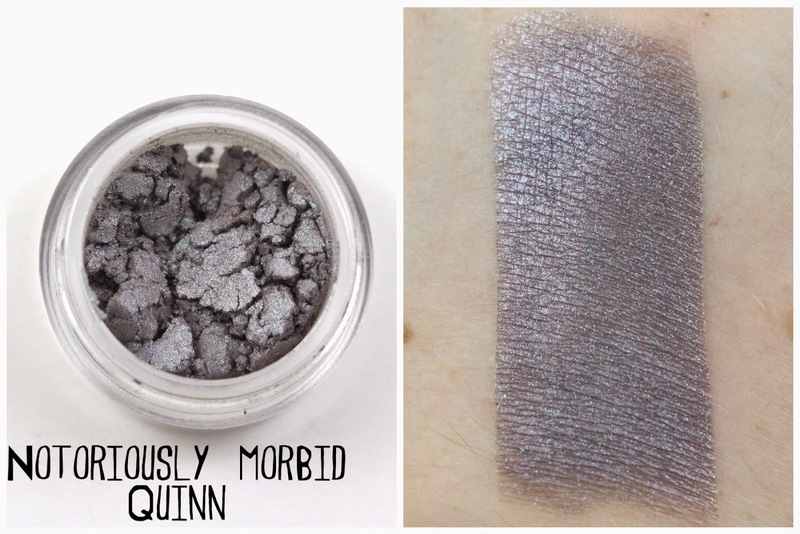 I really like this shade because it's not just a straight gray shade, but it has some character to it. 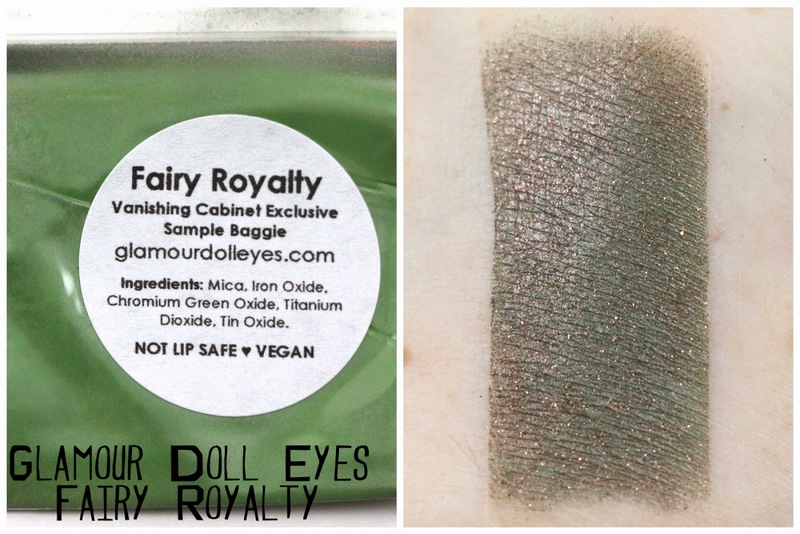 This is a muted forest green shade with a coppery sheen and large bronze sparkles. This shade was made by Glamour Doll Eyes for this month's collection. It's actually available for purchase in a full size jar from the Glamour Doll Eyes Storenvy page. The only thing I can think this shadow would be from is The Office. But I don't know how a purple shadow is representative of the scene from The Office. We'll find out next month! Overall, I loved this month's Vanishing Cabinet, the theme is something I enjoyed immensely, and the shadows are stunning. They are all shades I would love to wear paired together or by themselves. And the Notoriously Morbid shadow formula is one of my favorites so this was just a great month for the Vanishing Cabinet for me! If you'd like to subscribe to Notoriously Morbid's Vanishing Cabinet, there's currently a waiting list. Email Carrie at Notoriously Morbid to get on the waiting list. 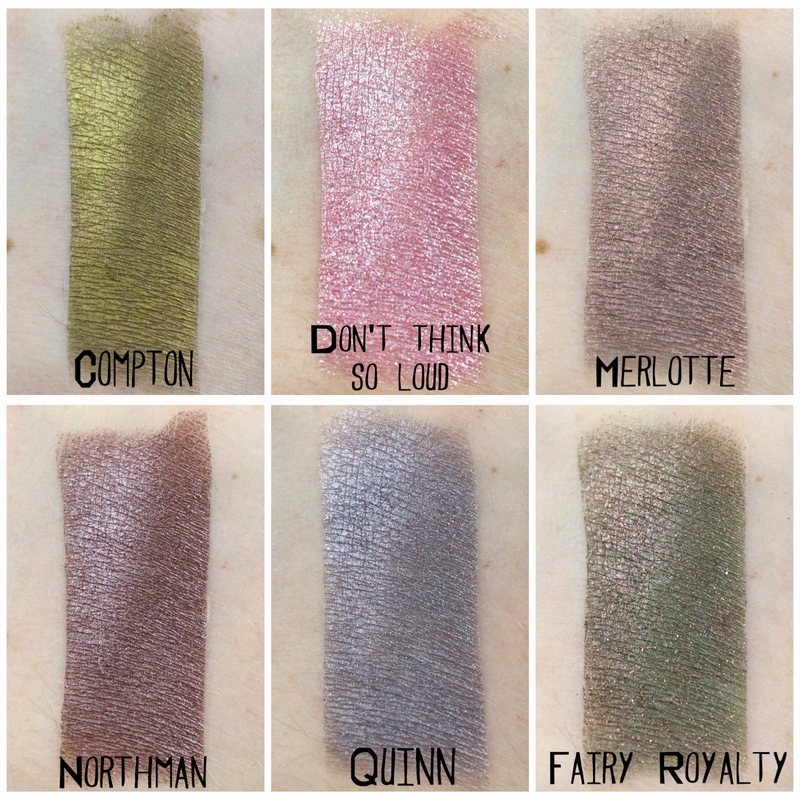 It's $12.90/month, it's a recurring subscription, that includes 4 mini shadows, usually 1-2 samples, and another bonus item. Gorgeous colours and I love the coffin box! I know, I thought that was such a cute touch! Hey! I live in West Virginia...wonder how long it would take to ship since I'd be somewhat local? ?